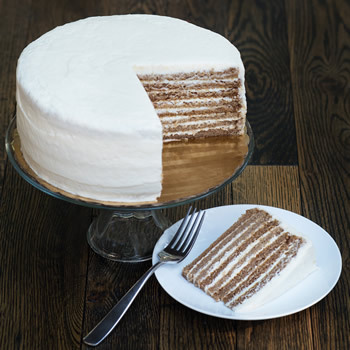 You've been asking for a Bananas and Cream Smith Island Cake, and we've listened! Featuring layers of moist, made from scratch banana cake, and covered in our rich cream cheese icing, this is sure to please the most discerning of palates. The cake is approx. 9" in diameter, 3.5" tall, and yields 14-16 slices. Like all SIBC products, it is shipped frozen with dry ice in a recyclable cake box.